I spent the first half of the epic Jubilee Bank holiday weekend revisiting Uni, where some of my friends had just finished their last ever exams. It was so good to be back there, if a little bittersweet. Such crazy times, and I really didn’t apprecitae how much I loved it and everyone I met there until I graduated last summer. Anyone enough of my wallowing – to celebrate the end of exams, we all decided to hit the uni club on Friday night. Clubs are always hot and sticky and over crowded, but for some reason uni-based clubs are always a million times worse. So obviously to keep cool (er), I always wear quite skimpy outfits. I then take a coat and leave it in the cloak room so I don’t freeze on the way home. 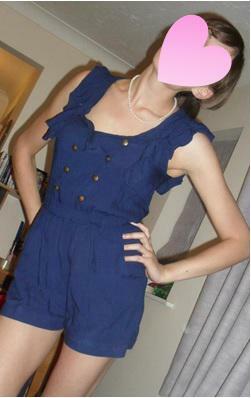 This is a really cute little playsuit I picked up as a complete bargain in the Republic sale. I love Republic clothes, especially for nights out – they always have so many amazing things. Playsuits are so good for clubbing, as one piece and 90% of your outfit is complete. They always seem so much less revealing that dresses (less chance of flashing an innocent bystander when you’re busting some shapes on the dance floor) even though they’re inevitably very short. This is such a flattering shade of blue, it fits a treat and has cute gold buttons down the front to give a kinda nautical feel – love this. I have to make a little confession with this particular piece though. I actually bought it last summer, shortly before I moved flats and in the packing panic I must have stuffed it into the odds and sods box, still in its bag with the tag on and everything. And there it stayed, until about a month ago when I finally got around to emptying that box ( I know, its bad) and to my absolute surprise stumbled upon this little piece of treasure. I’ve been waiting for an excuse to wear it ever since and just knew that a good night on it with my faves was the perfect reason. I wore it with metallic platforms and that was pretty much it.